Our range of products include Industrial Ceramic Wrapping Tapes such as Industrial Ceramic Fiber Wrapping Tape and Temperature Resistance Ceramic Fiber Ropes. We are delighted to offer Industrial Ceramic Wrapping Tapes that are manufactured using high-quality ceramic fiber yarn. The tape, which is reinforced with fiberglass filament, finds applications in sectors, such as welding, foundry works, aluminium and steel mills, boiler insulation and seal, exhaust systems, shipyards, refineries, power plants and chemical plants. Its major uses include Fire Protection, Pipe Hanger Insulation, Insulation of Industrial Chimney, Radiant Heat Shields, Filtration Media, Electrical Insulation, Expansion Joint, Gaskets and Wrapping Material and more. Ceramic braided packing are dense, high performance packing fabricated from ceramic fiber yarn braided around a core of ceramic fiber rope either to form a packing in Round or Square section. 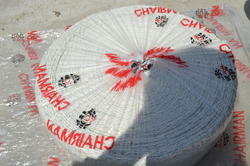 Shree fire pack textile family includes ceramic fiber rope, braids, cloth tapes, and sleeving. Ceramic fiber textile products are made from alumina-silica ceramic fiber, free of asbestos. 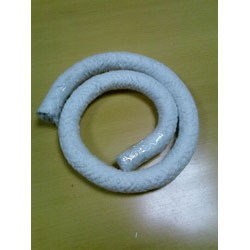 These non asbestos textile materials such as ceramic fiber rope can be used in different industrial applications under temperatures up to 2300 °F (1260 °C) and have excellent chemical stability and strong resistance to thermal shock and corrosion attack(Exceptions are hydrofluoric and phosphoric acids and concentrated alkalies). Ceramic fiber rope contain 15% organic carriers, which helps to establish physical formation of products which burn out at about 750 °F (400 °C). Ceramic fiber rope braided packings also contain reinforcement insert materials of either inconel wire or continuous fiberglass filament to increase handling strength during installation and enhance fiber durability to rated temperatures .Ceramic braided packing includes Ceramic fiber rope are dense, high performance packing fabricated from ceramic fiber yarn braided around a core of ceramic fiber rope either to form a packing in Round or Square section of desired sizes. Insulation of high-temperature tubes, containers, etc. The protection of cable, fuel tubes, etc. Fireproof twine, wrap, cover, etc. Our company is engaged in manufacturing and supplying a wide variety of Ceramic Fiber Wrapping Tapes that are highly cherished by the clients. These Ceramic Fiber Wrapping Tapes are basically used for Insulation of Chimney. The ceramic fiber wrapping tape is reinforced with fiberglass filament. We offer Ceramic Fiber Insulation Tapes that are fabricated using high quality ceramic fiber yarn and are reinforced with fiberglass filament & SS wire. Indian Ceramic Insulation Fabrics tape are woven in netted form made from Ceramic Yarn. Ceramic fiber insulation tapes are available in a variety of thickness from 3 - 6 mm. The standard width of the Cloth is 100 cm. Custom widths are available against request. 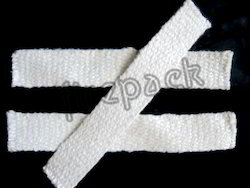 Ceramic fiber insulation tapes / strips are available in width from 25-100 mm. 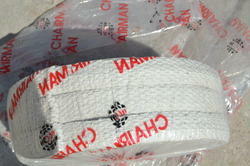 We are engaged in offering premium quality Ceramic Fiber Webbing Tapes.